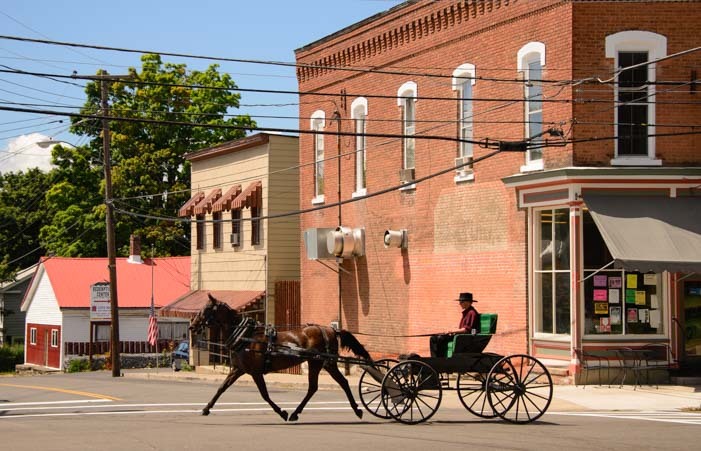 Finger Lakes, New York - Seneca Falls & The Amish! 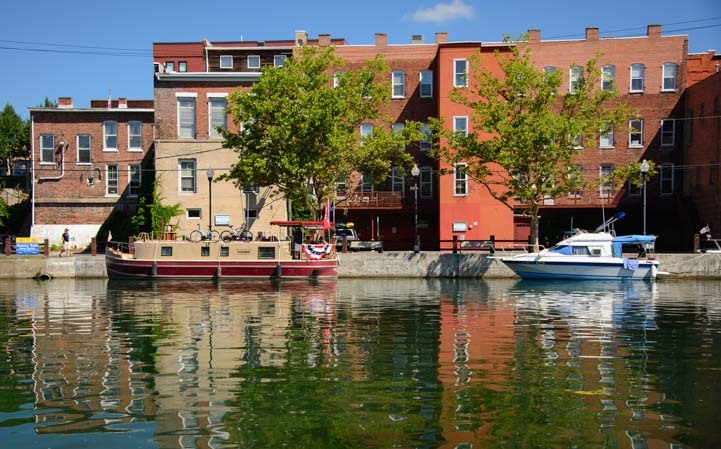 Finger Lakes, New York – Seneca Falls & The Amish! August 2015 – After our incredibly fun ride on the Mt. Washington Cog Railway, we zipped west across the tops of New Hampshire and Vermont. 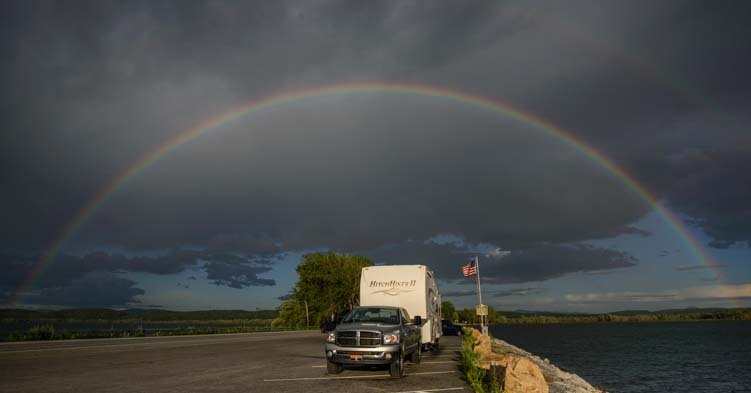 As we went around Lake Champlain, beautiful summer thunderstorms descended on us, and we found ourselves sitting under a rainbow in a scenic pullout in the middle of the lake. Our buggy tucks in under a rainbow! 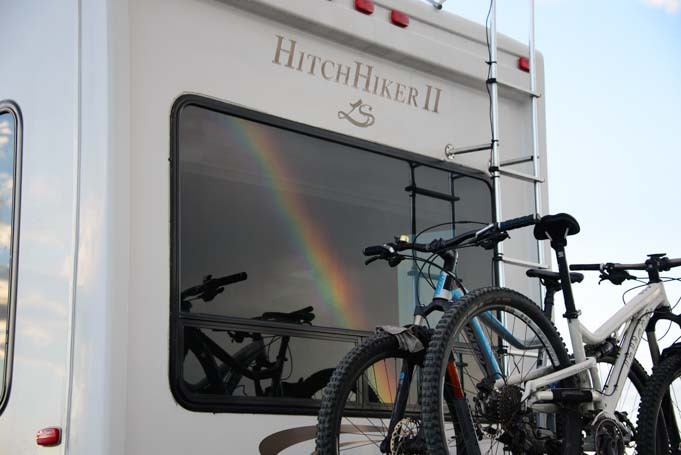 Looking for photo ops, we caught the rainbow’s reflection in the back window of our fifth wheel. We even caught the rainbow’s reflection off the back of the rig! Crossing into New York state, we dropped down through the Adirondacks to the Finger Lakes region. What a fabulous area. 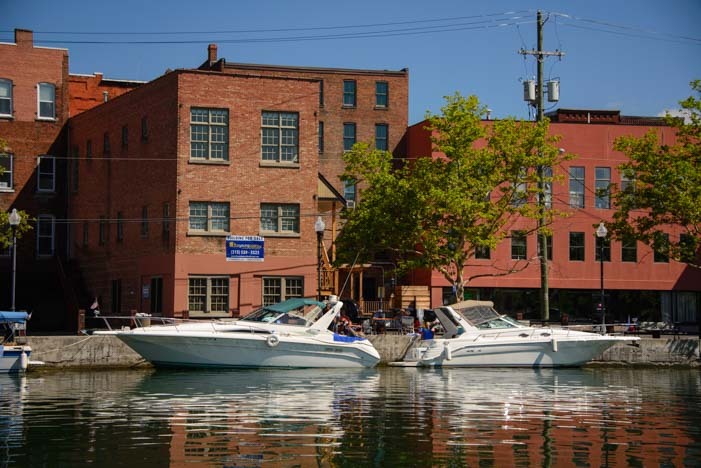 Pulling into Seneca Falls at the north end of Seneca Lake, we were enchanted by the boats lined up on the back side of the main street of downtown. 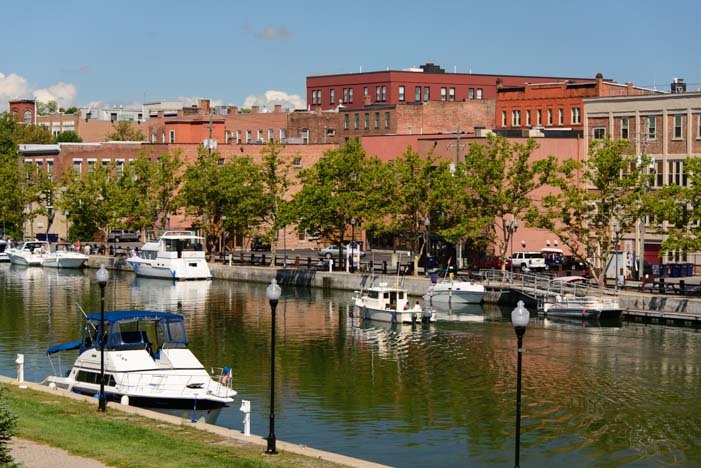 Boats tie up on the backside of Seneca Falls – what fun! Boats of all kinds were moored along the two sides of the canal. What a cool barge – with bikes on deck! We instantly began talking about what fun it would be to spend a summer on a powerboat exploring all the lakes in this part of the world. Maybe someday! The town of Seneca Falls is very pretty. The main street is lined with old brick storefronts. 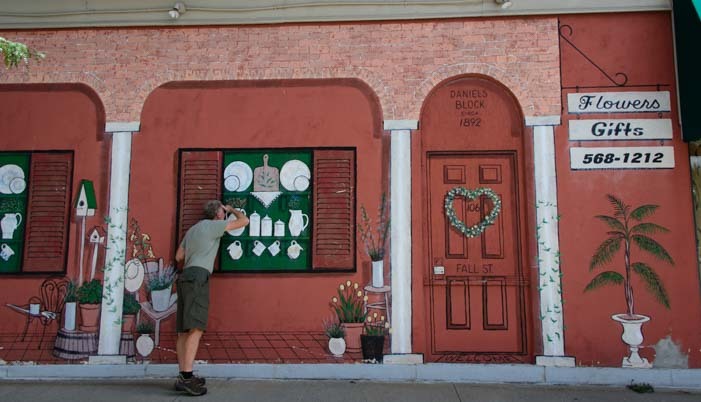 Mark even found an elaborate mural of a storefront painted on the side of one of these buildings. I think they’re open…try the door! Back in 1848, Seneca Falls was the birthplace of feminism. 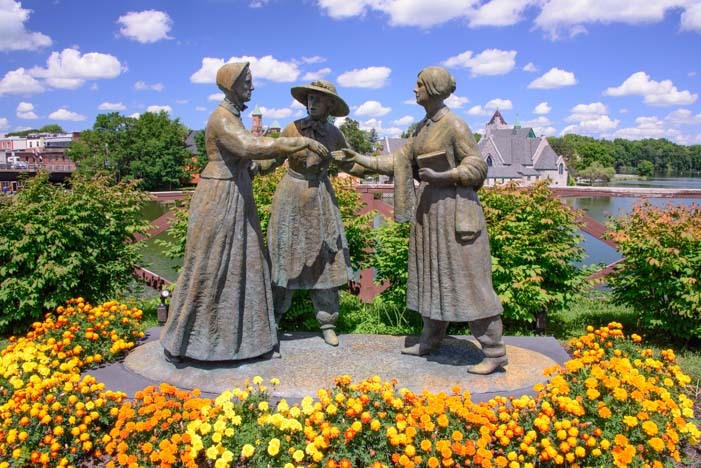 The concept didn’t have a name then, of course, but 300 men and women got together for two days for the first “Woman’s Rights Convention.” They drew up a document of resolutions — the “Declaration of Sentiments” — and 68 women and 32 men signed it. A wonderful statue commemorates the occasion on the banks of the canal, and there is a Women’s Rights Museum in town run by the National Park Service as well. Across the canal behind this statue stands the beautiful Trinity Episcopal Church. 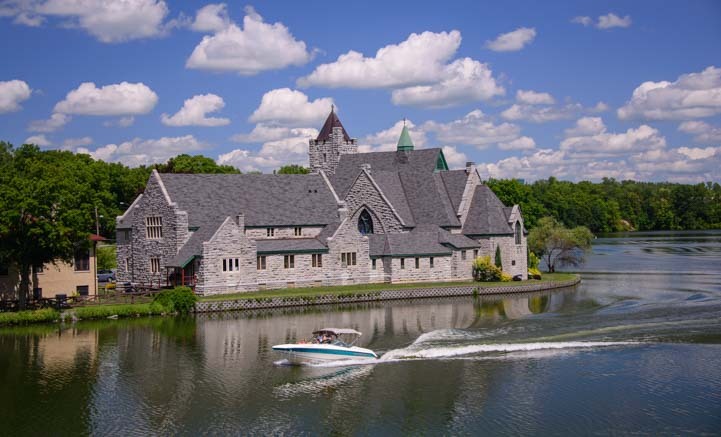 What a great setting, right on the banks of the canal that connects the north ends of Seneca and Cayuga Lakes. 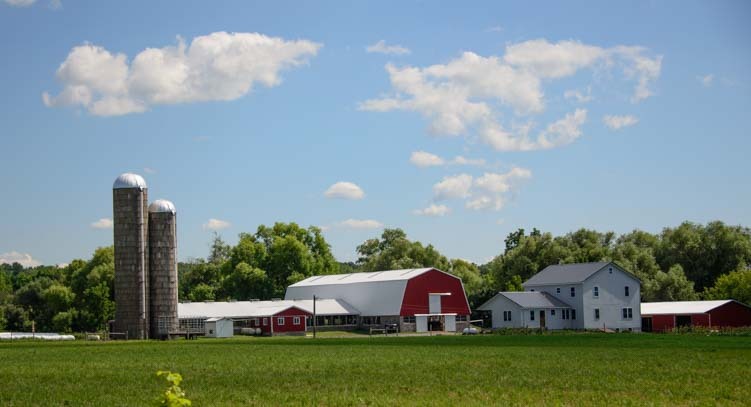 The Finger Lakes area is filled with small family farms, and we were thrilled to see one pretty farm homestead after another as we drove along the extraordinarily quiet rural roads. Small family farms dot the landscape between the lakes. 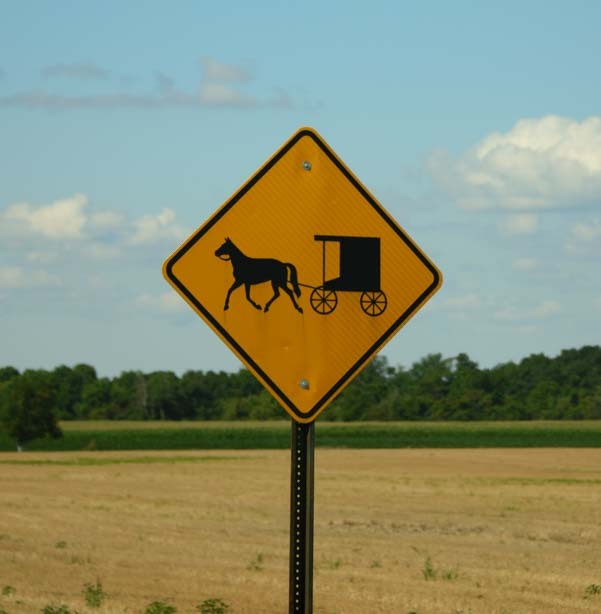 The Amish live in this area, and we soon saw signs giving away their whereabouts. There is something very romantic about horses and buggies and living simply. Seeing a buggy parked outside a barn was a thrill. 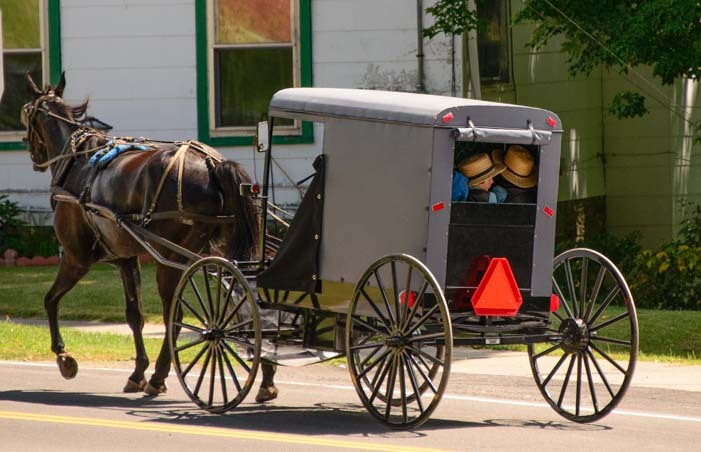 An Amish buggy waits to be hitched up. Stopping by the town of Ovid, we were delighted to see many more going by. First you’d hear the clip clop of the horses hooves on the pavement. Then the buggy would pull into view. Wow! There’s an Amish horse and buggy going by! There are open air buggies that the younger men use for courting, and there are covered family carriages. What was amazing to me was that these horses move at quite a clip, trotting along very fast. Looking at my photos later, in many of them all four of the horse’s hooves were in the air!! The clip-clop of horses’ hooves is a common sound in these parts. Did I mention how quiet the roads are out here? This is ideal cycling country for anyone that likes to ride a bike, and there is a peace and quiet in the air that is utterly refreshing and rejuvenating. Sunrise on a peaceful road. We are lucky enough to have very special friends who live in the area, and we settled in to stay for a while. Our own buggy, jazzed up a bit. There are 350 horses under that hood! 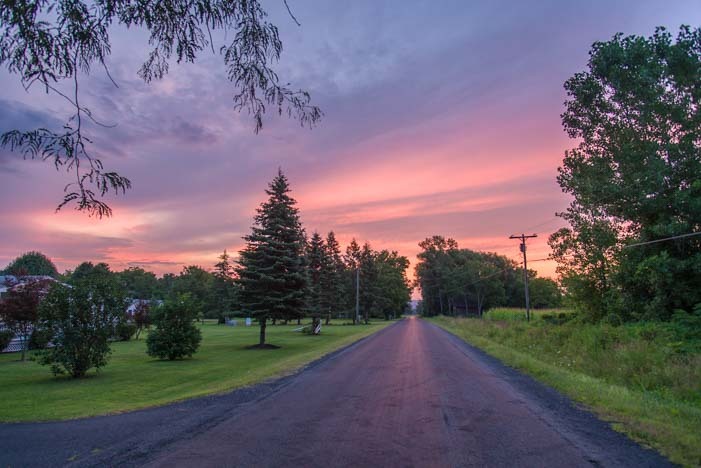 The New York Finger Lakes area is a wonderful place to take your RV. The driving is easy, the lakes are lovely, there is a winery every mile, and life is lived at a gentler pace. A pleasant RV park near Cayuga lake is Sned-Acres Family Campground. They have grassy sites set high on rolling hills for smaller rigs and a beautiful, new section with spacious pull-through sites for big rigs. The new section wasn’t quite open when we stopped by, but it will be open imminently. Have you ever thought about maybe sharing the different places that you and Mark have found to park and stay for a few days or even overnight? I have Days End and just recently purchased Wright’s guide to free camp grounds. 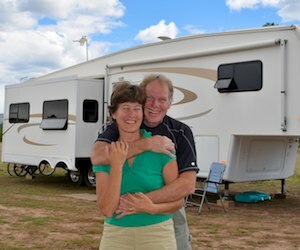 We have just started full timing as of a couple of months ago and are wanting to stay out of the high price RV parks as much as we can. Just a thought anyway. Hi Bob – I share a tremendous amount of information on this site, for free, and I put a lot of hours into helping others via the articles on this website and responding to emails I receive. Some of the info I share here has taken me a lot of study, research and time to learn. It also takes me many many hours to write up what I learn in a way that is easy for readers to understand. Some of the info I share is also very personal. All of this work is done in the spirit of giving, without asking for anything in return, in hopes that I can inspire others to be brave and live their dreams. Sharing the places we stay is not something I want to do. 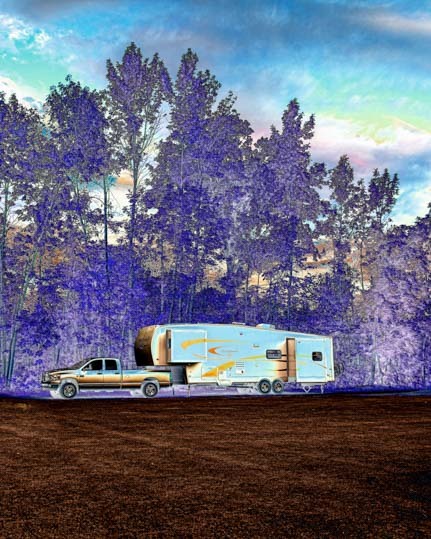 Finding great boondocking sites is one of the biggest thrills we experience in this lifestyle, and posting them online will prevent others from enjoying that thrill for themselves. I watched cruisers in Mexico do the paint-by-numbers style of cruising, going from one GPS anchoring position to the next as they followed the cruising guides. The sense of discovery and exploration was completely lost to them and they cruised on autopilot following the exact footsteps of the cruising guide authors, to the point that all the boats were crammed around one GPS point in every anchorage. There is something immensely satisfying about striking out on your own and making your own discoveries in your travels. Use the reference materials I mention and have a blast exploring!! Thoughtful good answer! We will do our best and look forward to every day’s new adventures. Thank you! Looks like a fantastic place. We will put it on our list 🙂 We are currently in Amish country too, although a little more inland- southern Indiana! I found your site while googling Nova Scotia, and enjoyed the photography and writeups. We are subscribed and will look forward to seeing more! Cool! I’m glad you found us. 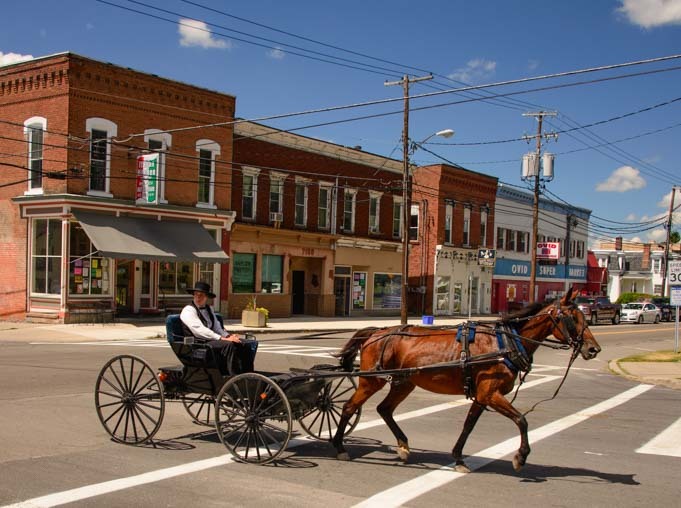 Have fun in the Indiana Amish country — and have fun in Nova Scotia too! And thanks for subscribing! !